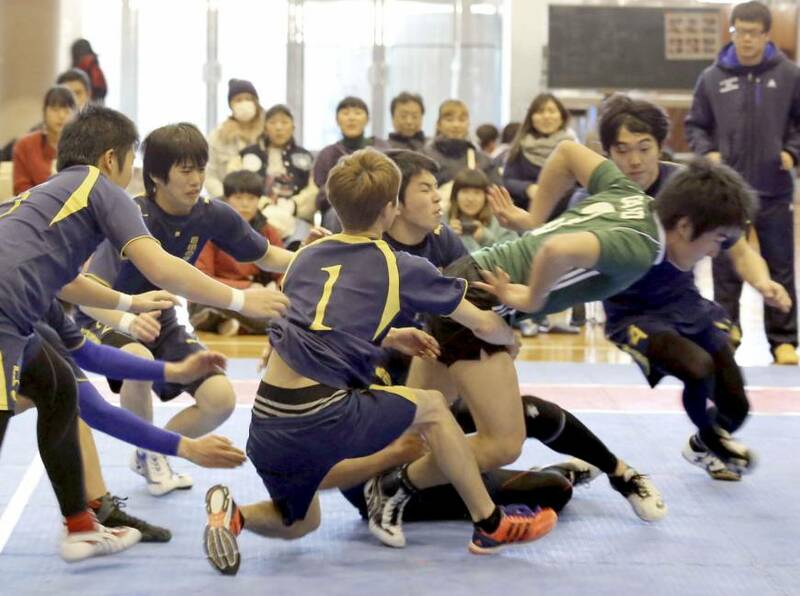 SAITAMA - Fascinated by the contact sport of kabaddi, a middle school and a high school in Saitama Prefecture beat a succession of collegiate teams this year to win the national student championship after learning the rules and tactics from scratch. Seven years ago, Jiyunomori Gakuin Junior and Senior High School in Saitama Prefecture created Japan’s only kabaddi club below collegiate level. Having stood on the national podium, they are now hoping the sport will draw wider interest from people in their generation. Kabaddi, which has its roots in India, is played between two teams of seven players on a small court without any equipment. The objective is for an offensive player known as the “raider” to tag the opposing team’s defenders in their half of the court and return safely to his own half without being tackled. The game’s name is said to derive from a Tamil word meaning “to hold hands.” The raiders are required to repeatedly chant “kabaddi” as proof the raid occurs during a single breath. A non-Olympic sport, kabaddi is popular in South Asia and has a large following at the Asian Games. It has struggled to gain traction in Japan, which only has about 400 registered players, according to the Japan Kabaddi Association. At a Tokyo gymnasium in June, the Jiyunomori Gakuen men’s team challenged an older university team. During one half, the younger players surrounded the university’s raider and a Jiyunomori defender set up a tackle, allowing his six teammates to hold the opponent tight on the floor. “Even if we have a disadvantage in terms of our physical size, we don’t lose in terms of technique and teamwork,” said 18-year-old captain Issei Ogawa, a third-year student at Jiyunomori. Katsumi Abe, at 15 the youngest player eligible to play on the men’s national team, hopes many students will follow in the footsteps of the pioneering athletes. The club was created in June 2011 after a second-year high school student asked his peers to play the sport in a school hallway after watching it on television. After the students discovered there was no kabaddi club below the collegiate level, they decided to create their own. The members learned the rules from the Japan Kabaddi Association and trained with university teams. They struggled against university and adult teams but managed to win their first official game in February 2013. Since then, the Jiyunomori Gakuin team has developed its strength and technique with support from alumni and become Japan’s top team this February at a tournament for university teams and below. “They were able to win because the students made efforts on their own, and this bore fruit as adults who were moved by their passion supported them along the way,” said Kaho Suga, a Jiyunomori teacher who oversees the team. The Japan Kabaddi Association has been aiming to attract more people to the sport by holding demonstrations around the country. “I want to establish more opportunities for the younger generation to experience kabaddi,” said Yoji Kawai, 43, an association official.